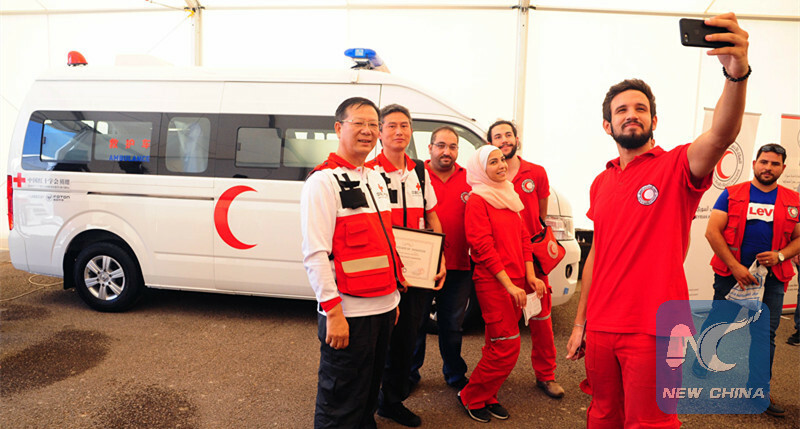 DAMASCUS, Aug. 16 (Xinhua) -- The Red Cross Society of China (RCSC) on Thursday donated mobile medical clinics and ambulances to Syria's Arab Red Crescent (SARC). The donation, which included two bus-turned mobile medical clinics and two ambulances, was delivered at a ceremony held in the Syrian capital Damascus. It aims to help Syrians living in hard-to-reach areas or those who need emergency care. 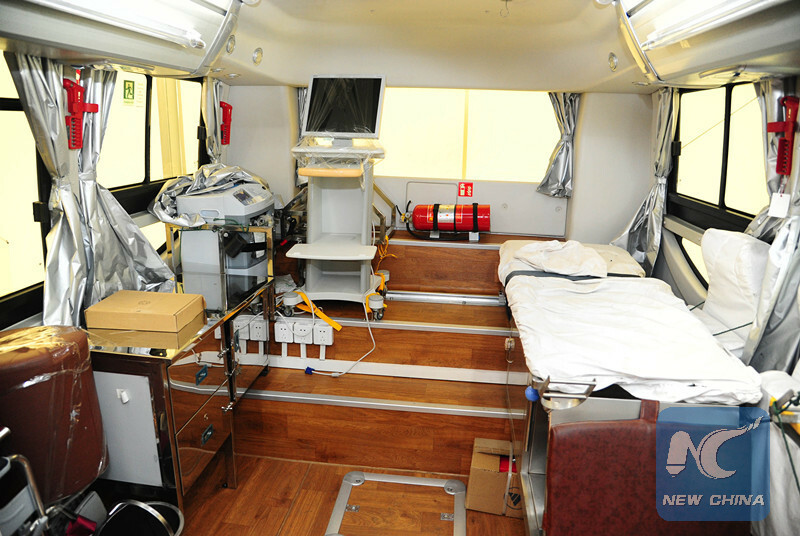 Wang Qinglei, the representative of the Beiqi Foton Motor, the company that took part in the funding of the donation under the RCSC umbrella, told Xinhua the mobile clinics are equipped with X-ray machines, ultrasound scanner, defibrillator, distance diagnosis and treatment system. He noted that these medical equipment turn the bus into a mobile hospital, which can offer emergency medical care, health examination and mini surgeries. The vehicles are powered by an electrical power generating system, which enables the clinics to operate in areas where electricity is not available. Wang pointed out that his company's total donation is estimated at 6 million yuan (roughly 900,000 U.S. dollars). It is part of the first stage of the total humanitarian aid provided to Syria by the RCSC, which is estimated at 8 million yuan. "If put into use, the medical units could serve hundreds of people every day, especially for the war-torn and remote communities," Wang said. For his part, Muhammad al-Jarrah, head of the medical services in SARC, told Xinhua this kind of assistance is crucial in hard-to-reach areas as well as in the time of emergency. 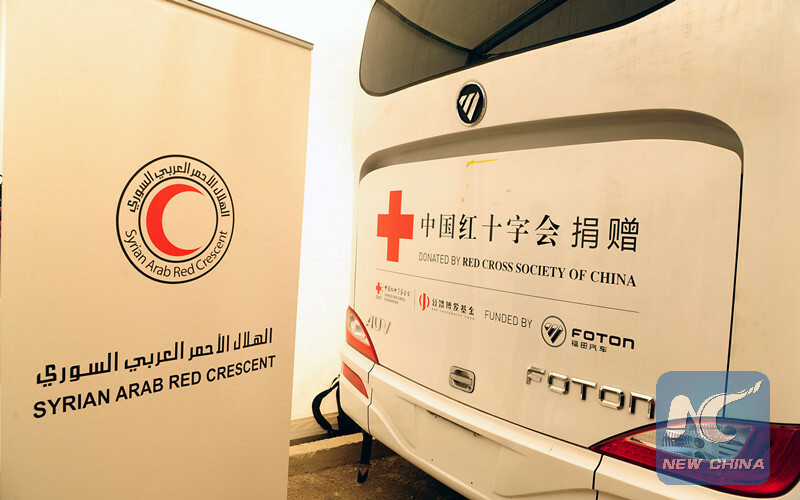 Sun Shuopeng, the executive vice president and secretary general of Chinese Red Cross Foundation, said that the RCSC is carrying out comprehensive humanitarian aid projects in Syria, which include donating mobile medical units and establishing prosthetic rehabilitation centers for Syrian children. On Wednesday, the Chinese delegation inaugurated a children prothetic rehabilitation center funded by the RCSC in Damascus. "All funds of the prosthetic rehabilitation project were raised online by the Chinese public. We launched an online fundraising project called One Dollar for Syrian Children," Sun told Xinhua, adding that the project raised 100,000 U.S. dollars in a short time. Following the delivery ceremony, Chinese engineers and technicians also trained the Syrians to operate the equipment and do the maintenance work.